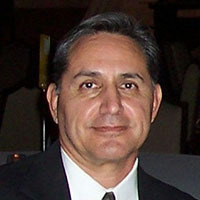 Commissioner Fred Barraza is a multimedia artist, working in printmaking, painting, drawing, illustration, and sculpture. He was born and raised in the Grant County area of Southwest New Mexico. After serving in the United States Marine Corps he received his degree in Fine Arts from Western New Mexico University (WNMU). He then took a job with the Department of Cultural Affairs providing library services to rural communities in Southwest New Mexico in the State Library's Rural Bookmobile. He was the Director of the Southwest Bookmobile for the majority of his 25 year career. After retiring in 2008, he taught drawing classes, art appreciation and a printmaking class at WNMU. Additionally, Barraza has created posters for various organizations, many book covers and has illustrated two children's books. Barraza served 14 years on the WNMU Foundation Board and three years as a Grants Peer Panelist for New Mexico Arts. He also served on the Mimbres Region Arts Council Board for four years, and has been involved with three Mimbres Region Arts Council mural projects in Grant County. He worked with NM SOS! (Save Our Sculpture) and was the curator and organizer for the exhibit Expresiones Conjuntas presented at WNMU. He is interested in all aspects of the arts and is an advocate of the arts for children and adults.